Green Scheme is a private company owned and operated by its partners. It is focused on providing the very best local service to companies in the Midlands. Nick and Susie Tawney started supplying and maintaining office plant displays in 1987 and the company now works for a range of clients, large and small, right across the Midlands. Nick, a former market researcher and his wife Susie, previously a teacher, share a passion for plants. 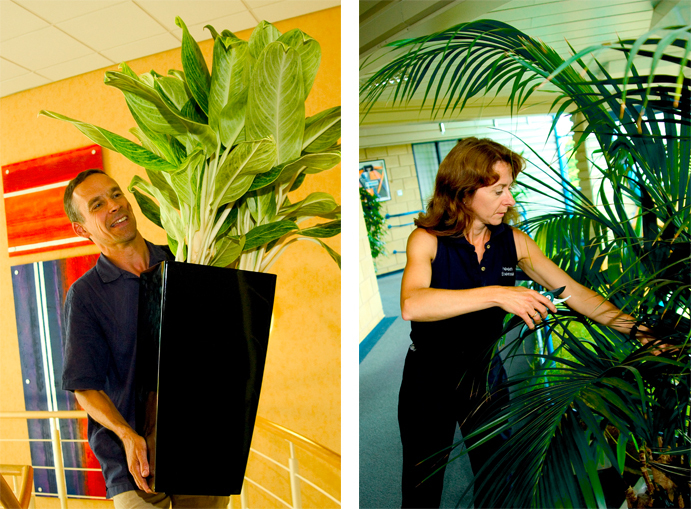 They run Green Scheme from home near Leamington Spa in Warwickshire and both derive enormous pleasure from creating a beautiful environment for their clients and making sure that their office plants thrive. Over 30 years of experience guarantees you peace of mind. Access to a vast selection of containers means that we can supply exactly the style and quality to meet your budget. Low overheads mean very competitive prices and excellent value for your money. We only service businesses within an hour’s drive of our base to ensure a fast and efficient service for you. Green Scheme has grown through word of mouth recommendation and by retaining accounts as their clients have themselves grown.